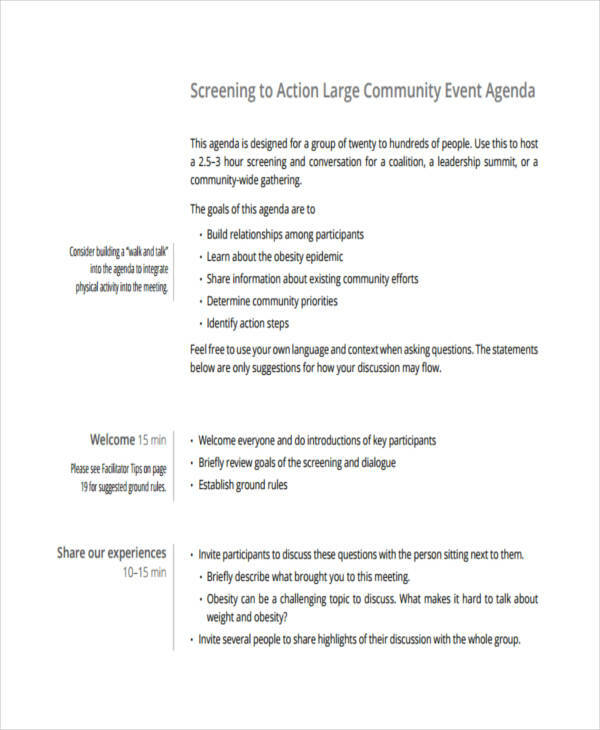 The agenda—or simply put, things to be done—is important in planning for an event or meeting. It puts into perspective the exact reasons why the event is being held. It also organizes the event to ensure the event goes or proceeds without hitches. 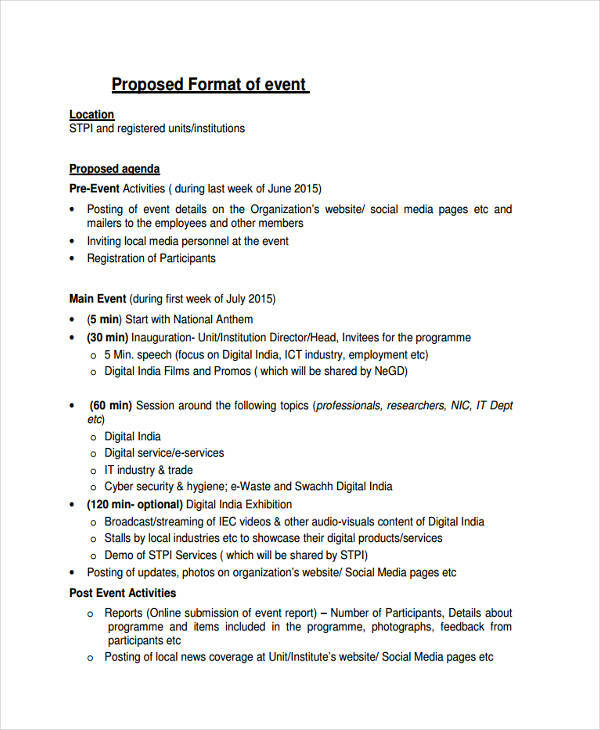 It also details the persons left in charge to various segments of the event; promoting even further order to the event. 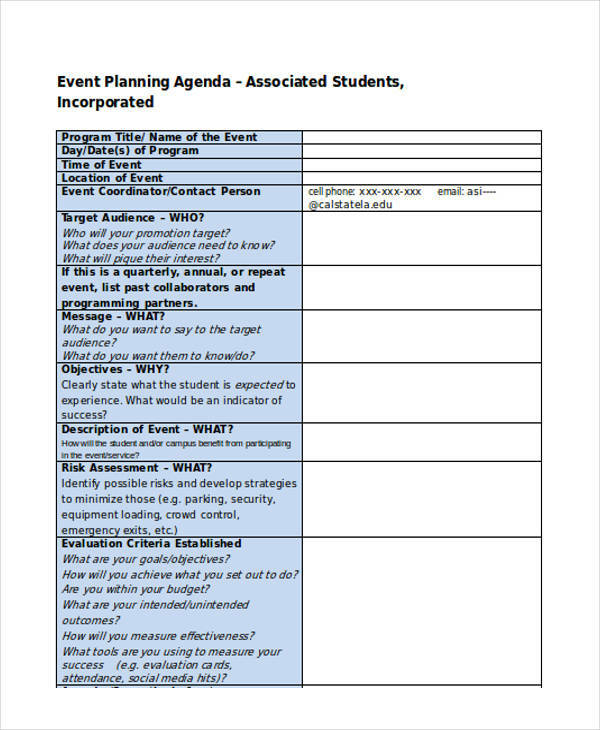 Event agenda examples can be found all over the page to suit your agenda needs. All of the samples are available for download by simply clicking on the download button below the sample. So relax, and let us help you in organizing your next event. The agenda for meetings that we currently use now derived from the book Robert’s Rules of Order published by US Army Major Henry Martyn Robert in 1876. They were modeled after procedures in the United States House of Representatives that he made adaptations in relevance to ordinary society conventions. Several subsequent editions followed as the rules were more and more defined and refined to fit almost any social meeting or event. 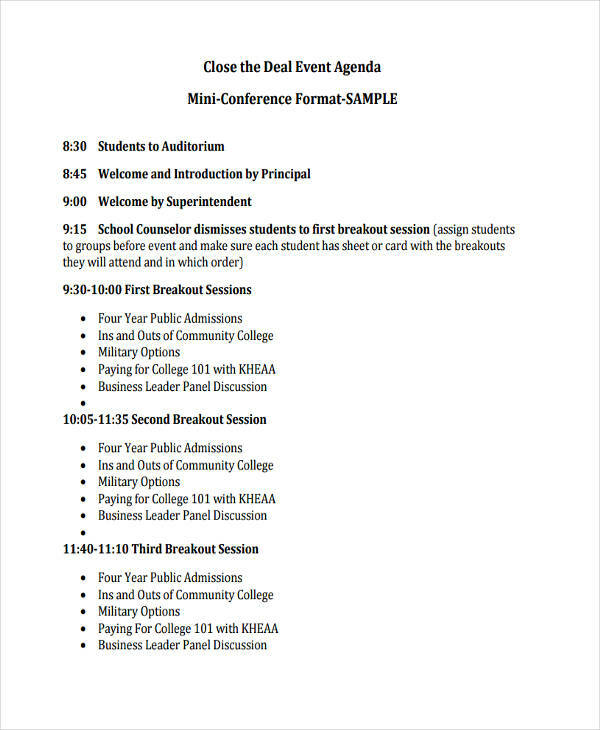 In practice, the agenda is sent along with the notice of the meeting sometimes referred as event brochure for certain assemblies. At other times, the agenda itself becomes the notice of the meeting. 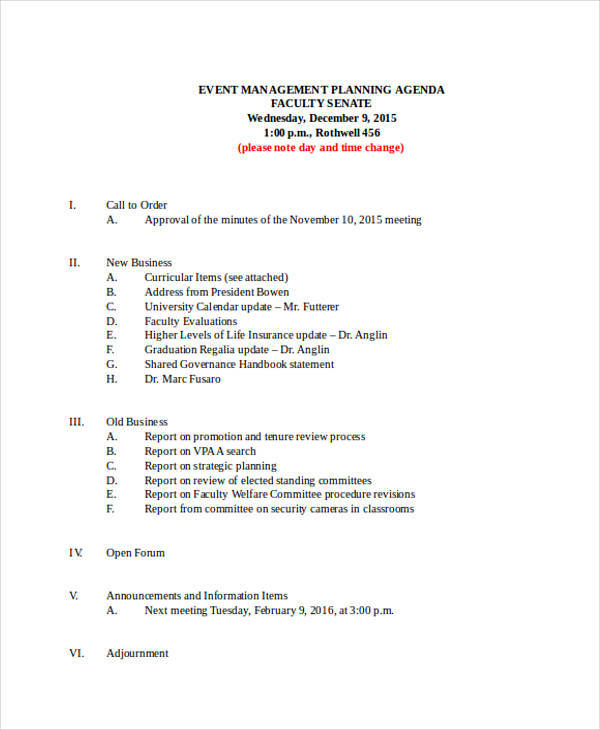 As the topics of the meeting are sent in advance, members attending the meeting can prepare before hand any questions or issues they want to raise regarding a specific topic in the agenda. The agenda of the meeting is commonly seen at the end or before the signature of the one presiding over the agenda or meeting. It is usually arranged in a manner where the most important points that need to be discussed are first and the least at the last part. This helps ensure the smooth running of the meeting or event. 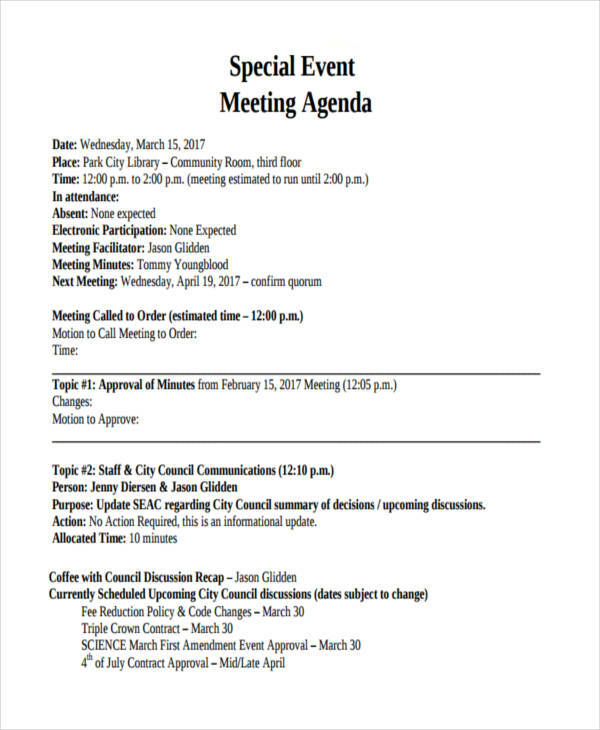 Special or topics of interest are usually scheduled at the latter part of the meeting. As everyone attending is on a set time, it is important to discuss first matters already defined to avoid wasting time. Topics discussed during the meeting are predetermined by the officer presiding over the meeting and written by the secretary of the organization holding the event. The secretary helps write the minutes of the meeting and the resolutions made during the meeting. The agenda itself is written in a brief and concise manner. The finer details are usually left out at the exact moment of the meeting. Any issues met can be raised at the right time and deliberated within the allotted time. Call to Order – This is usually made by the presiding officer announcing the start of the meeting. Opening Ceremonies – Customarily, the opening ceremonies are done with an opening prayer or invocation, which is followed right after by a pledge of allegiance and in some cases, the playing of the national anthem of the country. 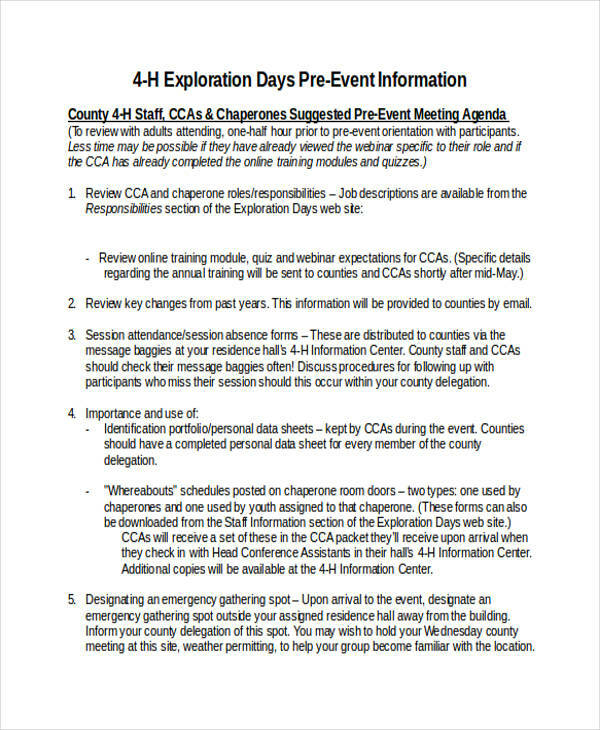 Consent Calendar – This item in the meeting calls to act on a motion to approve or disapprove any strategic or action plan that can be easily decided on without deliberating so much regarding the decision. This would commonly contain issues that are of very low importance and this list can be decided upon right away. 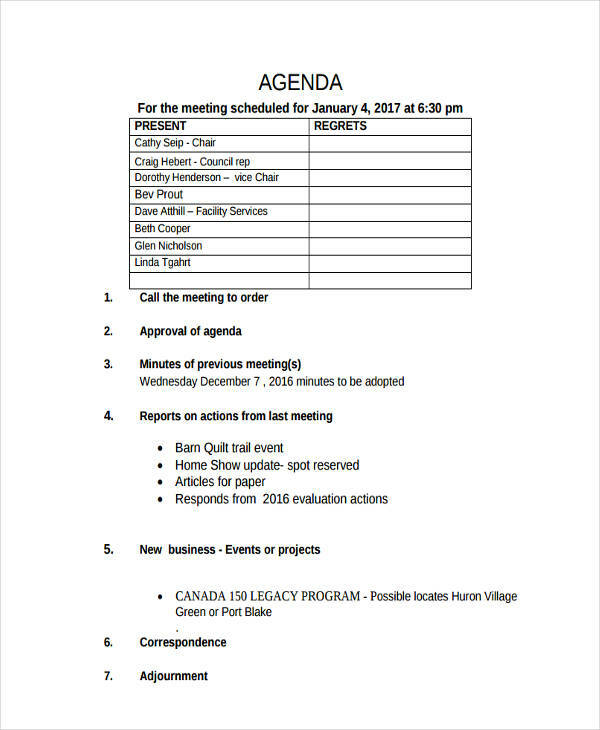 Standard Order of Business – This segment contains what the meeting was called for and all other pertaining plan of action that need to be discussed. As with any other segment, the items discussed are also arranged in order of priority and importance. Good of the Order – Commonly called as open forum, this part of the meeting is where any member can comment directly or raise an issue regarding the organization or the community the organization is in. This time is also used in resolving conflict between members or resolutions resulting from offenses done by a member outside of the meeting. 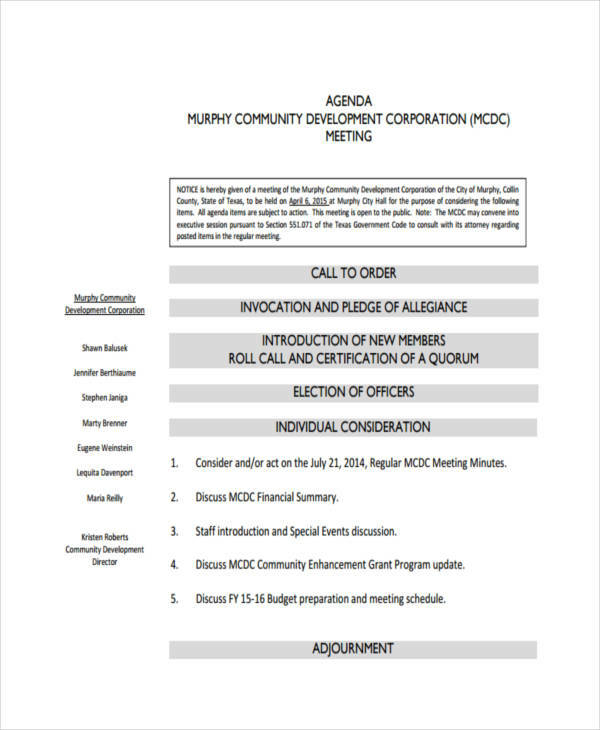 Announcements – This time is given to officers to give out any announcements regarding the organization or of another future meeting and the possible agenda to be discussed during the next meeting. 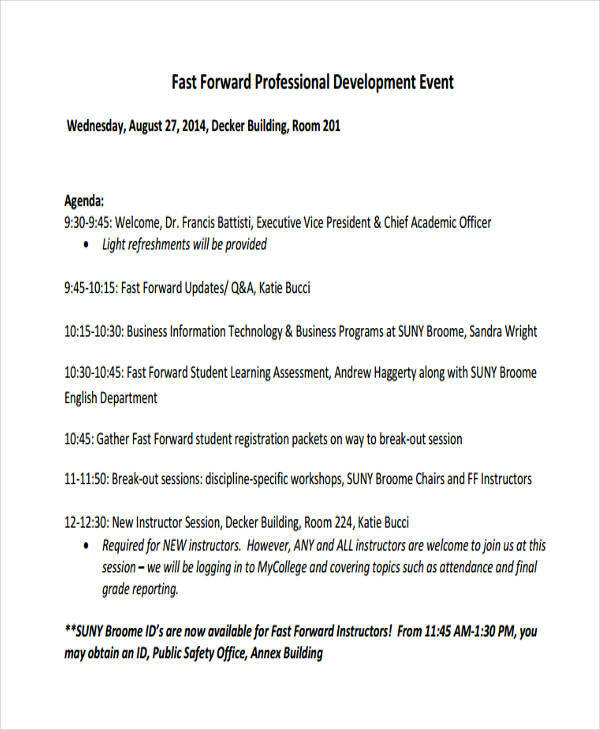 Program – This segment is provided for designated speakers or any video presentation. It is upon the presiding officer or officers to assign where in the meeting the program will be. This can either be done right after the minutes of the previous meeting are read or inserting it within the standard order of business of the meeting. End of the Meeting – Announced by the presiding chair or residing officer, this signifies the end of the meeting when all important resolutions have been passed or postponed in wake of another meeting. 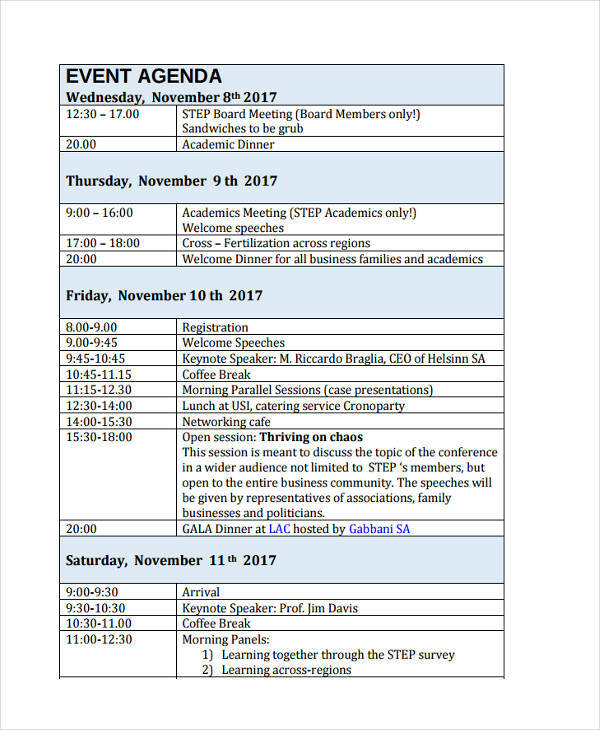 Networking Event Agenda – An example of a general networking event agenda is shown on the page. 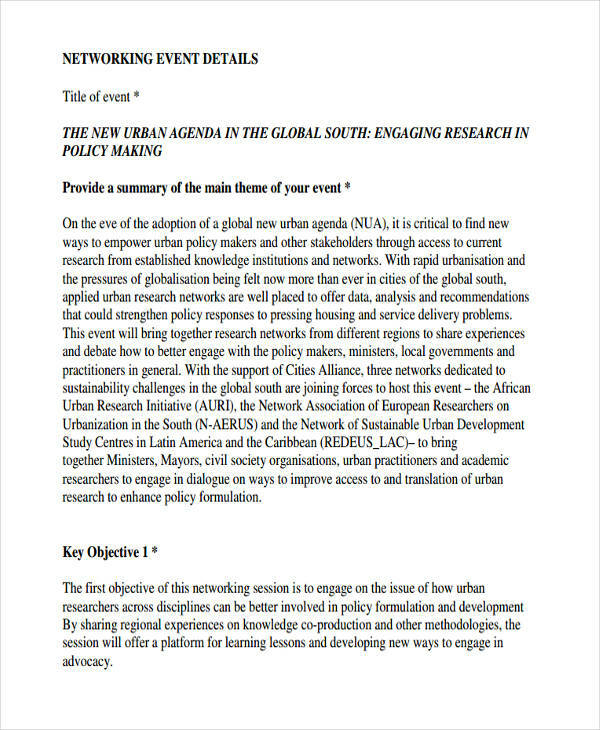 A key description is providing the summary of the theme of the meeting at the beginning of the meeting. 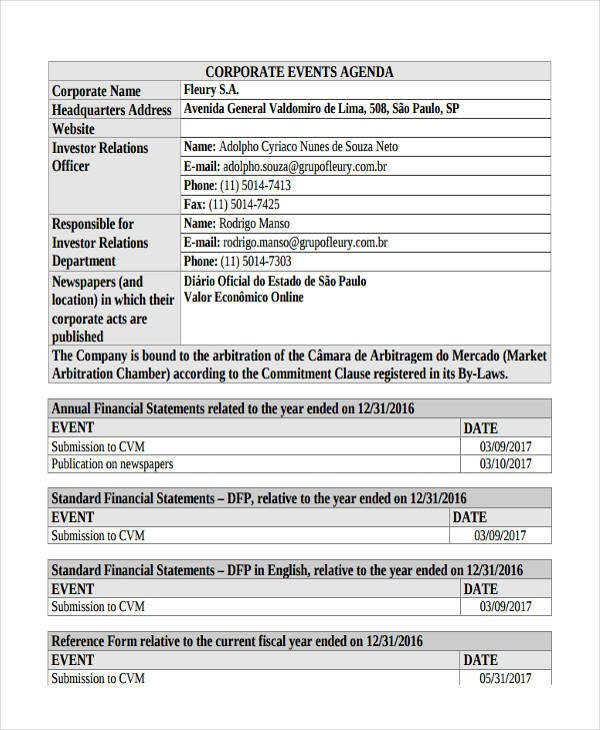 The network event agenda example shown provides more details pertaining to the time and the segments involved in the meeting. 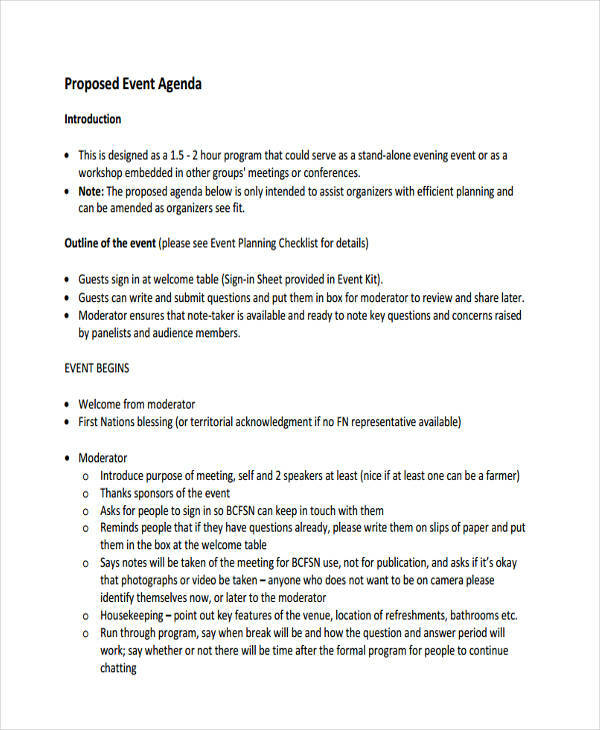 Event Planning Agenda – This example shows a more standard approach to conducting the meeting as it clearly indicates segments from Robert’s Rules of Order namely call to order, orders of business, the open forum, and finally adjournment of the meeting. 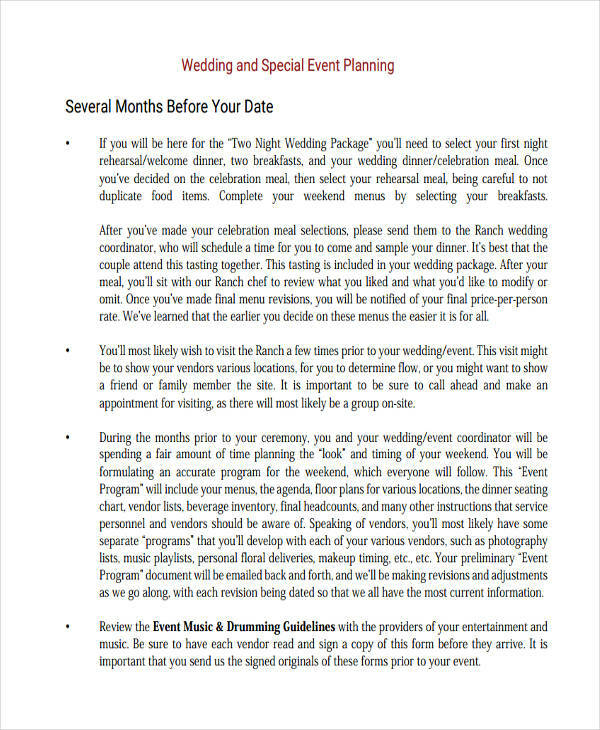 Wedding Event Agenda – Shows a wedding reception event agenda questionnaire for the receptionists to determine the order of which to arrange the reception and how the whole reception is likely to be set up. 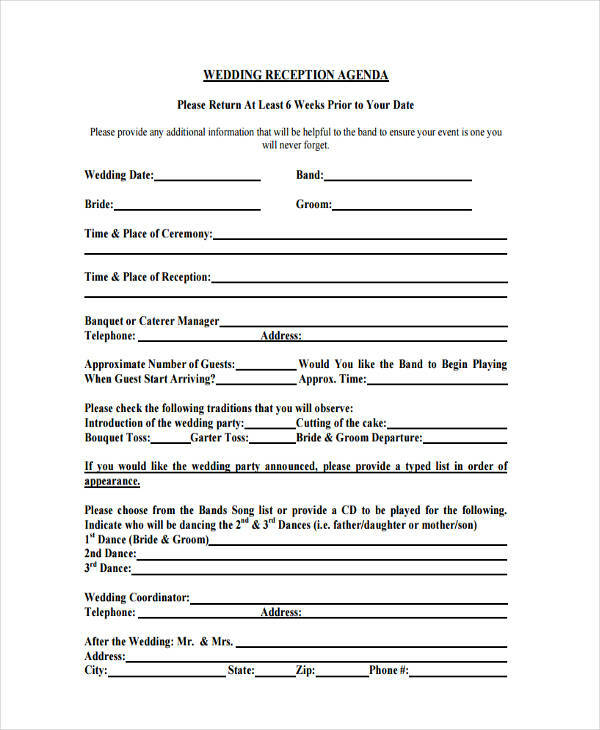 See also wedding invitation examples in this site. 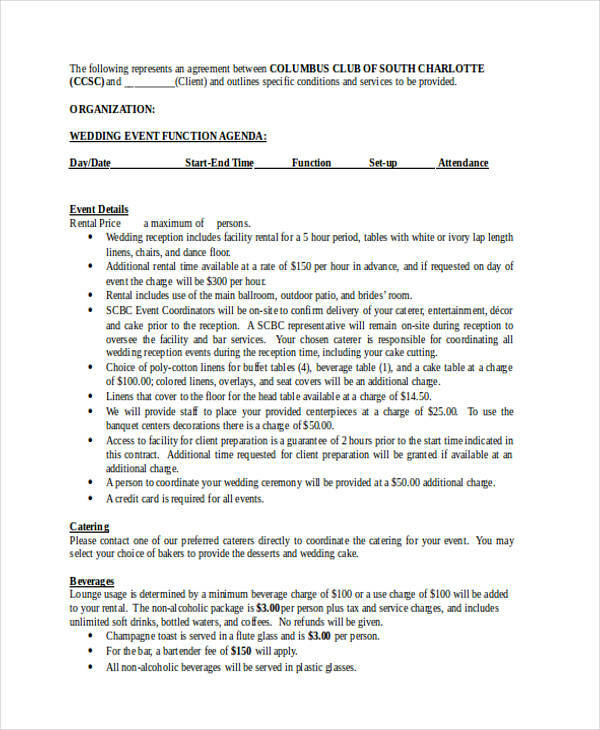 Corporate Event Agenda – Corporate events are usually planned via fiscal year. The events involving the corporation are intended to be planned on a yearly basis as these have to be included in the approval of funds for each financial year. The sample clearly shows this as it details corporate spending for the dated events. 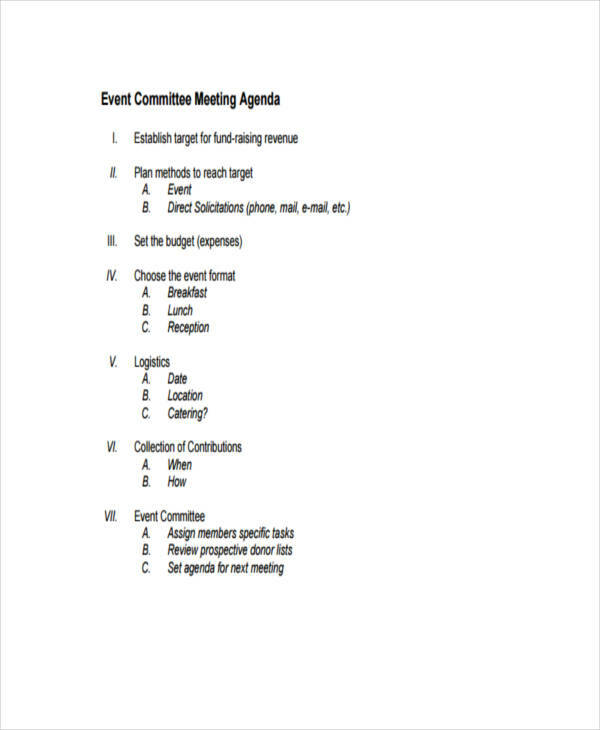 Event Committee Agenda – The sample event committee meeting agenda shown on the page shows how the work for the event is distributed among the committee and plans prior to the event are being discussed. 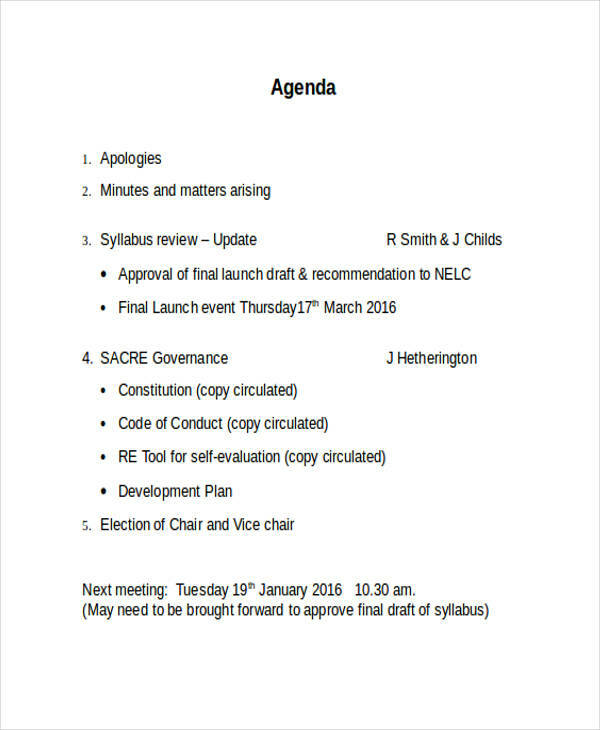 Community Development Agenda – Shows another great example of a standard agenda following Robert’s Rules of Order in a meeting. It clearly shows the different segments as stated in the rule book. 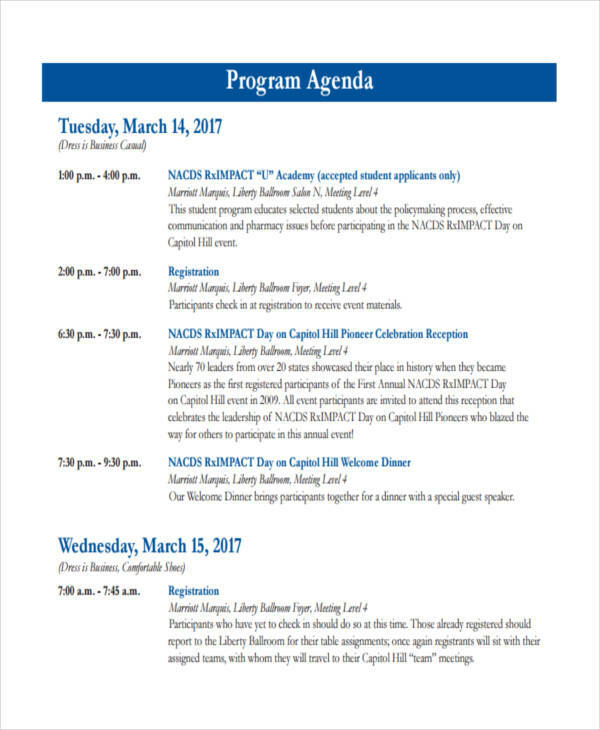 Business Event Agenda – Another great example showing the segments of a standard meeting from Robert’s Rules of Order in a meeting. 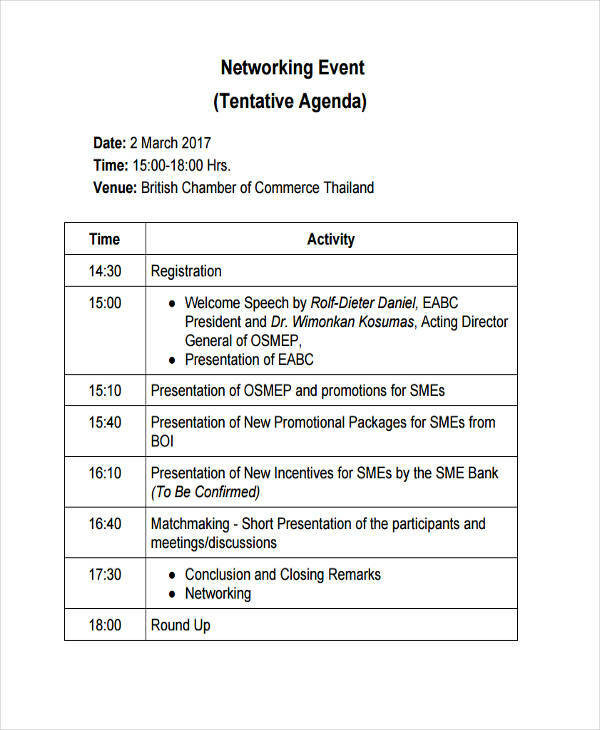 The free business event agenda outlines the event from call to order to adjournment of the meeting as based on the the standard meeting guidelines. 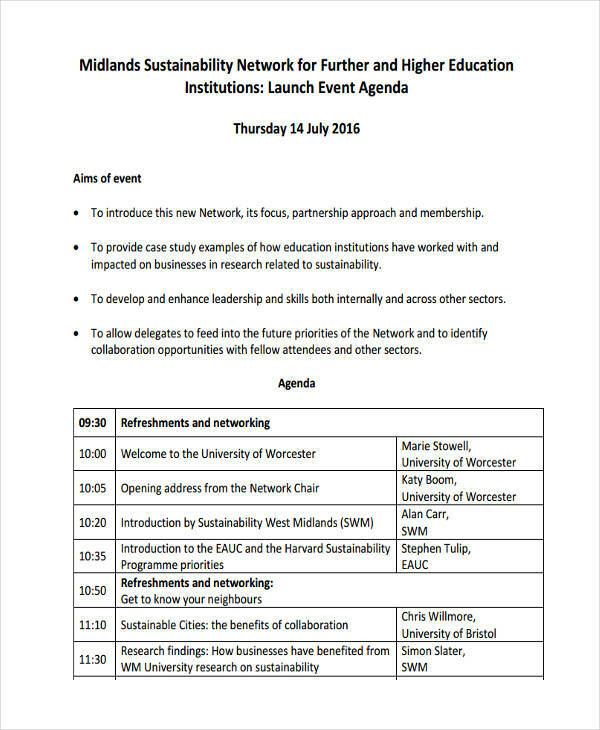 You can also refer to business invitation examples for more information. 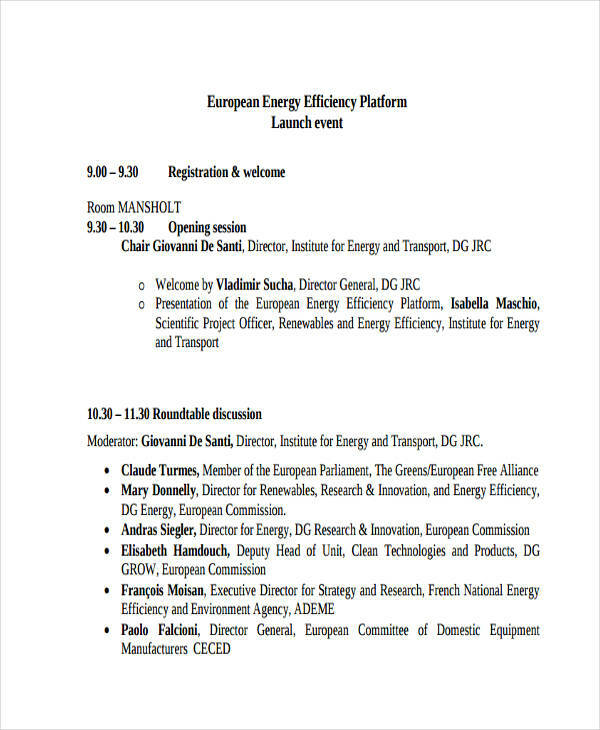 Launch Event Agenda – An example of a launch event agenda is shown above that outlines the purpose of such an event and the general program and arrangement of the speakers of the event.